From left to right: Roger Tucker (VJ), Martin Kane (Severn Trent) and Mark Oliver (BBUS) The Remote EasiClamp, from Viking Johnson, has won the SBWWI Award for Best Product Innovation. Viking Johnson, together with Balfour Beatty Utility Solutions, has won the prestigious SBWWI Water Dragons Award for Best Product Innovation 2010, for the development of its innovative new Remote EasiClamp. Viking Johnson, a leading brand of Crane Building Services & Utilities, is a market leader in the design and manufacturing of mechanical couplings and flange adaptors, pipe repair products and flow control solutions for water and wastewater applications. Launched in late 2009, Remote EasiClamp is set to revolutionise the water industry, helping water companies to reach water leakage targets set by Ofwat. It has been designed by Viking Johnson to deliver a quick, safe, permanent repair to a damaged pipe at full operational pressure, with out having to enter the trench and with minimal excavation. The major benefits of this innovative and patented repair solution include the ability to maintain continual water supply to customers, the minimising of health and safety risks to operatives and a significant reduction in installation costs, traffic disruption and spoil. In the development of this revolutionary fitting, Viking Johnson worked closely with Balfour Beatty Utility Solutions to ensure the new clamp exceeded the requirements of both operators and water companies. 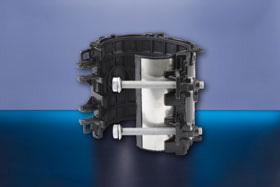 The clamp consists of two halves that are hinged, fully opening to permit quick and easy fitting on the pipe. Two patented self-retaining bolts are used to tighten up the clamp which speeds up the repair process and minimises disruption to water supply. Since its launch, nine UK water utilities have approved the Remote EasiClamp for use. Eight others have indicated their desire to undertake trials prior to sanctioning its use. Operators using the product have acknowledged the benefits with respect to ease of installation, and health & safety. The remote installation process on pressurised mains has been endorsed by Balfour Beatty Utilities Solutions during recent trials at their test facility in Derby, where they verified the products. After being nominated for the award, earlier in the year, Viking Johnson and Balfour Beatty Utility Solutions have undergone a rigorous selection process. SBWWI were impressed by the innovation during product demonstrations and presentations of cost savings and health & safety benefits. The Award was presented at the annual SBWWI Awards Lunch, in Warwick, to a representative from both companies. For more information please contact Simon Shand-Brown, Group Marketing Communications Manager, on 01473 277300 or sshand-brown@crane-ltd.co.uk.